Strong legal representation with a personal touch. We are a full-service law firm capable of providing excellent legal representation across a broad spectrum of practice areas. No matter what legal challenges you are facing we have the capabilities and skill to provide you with the best possible legal counsel. As a full-service firm we are invested in the relationships that we build with our clients and aim to serve as lifelong legal consultants. When you retain our legal counsel you can be assured that your case will be given the best available legal representation available. Paul’s practice areas consist of DUI, Criminal, Family Law, Probate, Wills, Guardianship, Social Security, Automobile Accidents, wrongful death, and Personal Injury. He is admitted to practice in all Oklahoma State Courts. Paul’s experience in the Tulsa County District Attorney’s Office has brought him a wealth of experience from the courtroom and taught him how much a good attorney can make in helping a client through a stressful and difficult time in their life. Born in McAlester, Oklahoma in 1984, Paul was raised in McAlester. He is the youngest of three children of James and Susie Northcutt. James, a former Superintendent for McAlester Public Schools, and Susie, former school librarian for McAlester Public Schools, are now retired. Paul graduated from McAlester High School in 2002 and then attended college at the University of the Ozarks, where he played and excelled in tennis. He received his Bachelor of Science in 2006 in Accounting. From 2007-2010, Paul attended the Oklahoma City University Law School. During his time at law school, he received his legal intern license and worked at the Oklahoma County District Attorney’s Office. While interning at the District Attorney’s office Paul conducted several preliminary hearings and discovered his love for litigation and the courtroom. Paul passed the July 2010 bar exam and immediately began working for the Tulsa County District Attorney’s Office. Over the next two years, Paul prosecuted a wide variety of cases including several felony jury trials. 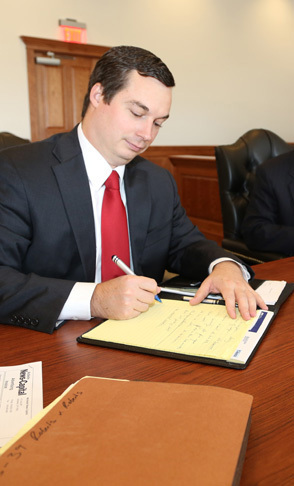 Paul returned to his hometown of McAlester in the fall of 2012 as an associate at the Edwards Law Firm. During his tenure at the Edwards Law Firm, Paul practiced law in several areas including DUI, Criminal, Family Law, Probate, Guardianship, Social Security, and Personal Injury. In the spring of 2015, Paul and Michael joined together to form the law firm of Hogan & Northcutt, PLLC. Paul is glad to be back in his hometown practicing law. In his spare time, Paul enjoys golf, tennis, cross fit, and traveling.